We don’t shy away from sharpness, so we adore this been-around-the-block cheese for its full-flavor cheekiness. You see the life experience in its beautiful crystalline cracks and you taste it in its always complex and sometimes tangy flavor. This lower-moisture, often flaky cheddar is sometimes but not always clothbound. Any way you slice it (or not), live free, aged cheddar -- you’ve certainly done your time! We leave the melty, ooey-gooey dishes to young cheddars. 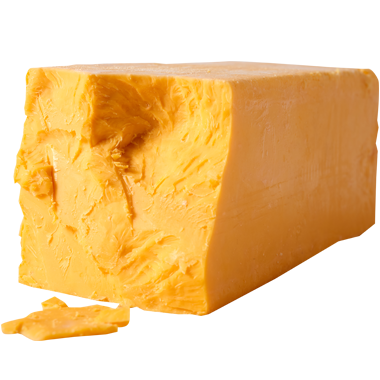 Aged cheddar has earned the right to be left alone next to breads, pastas and robust soups. Aged cheddar likes to be eaten with a little sticky sweetness, so we often serve it with a homemade jam, chutney or honey. You can also get to that winning combo by way of tart with sweet pickles or pickled beets. It makes for a classic English Ploughman’s lunch (cheese, fruit and veggie board) and we also love it with big, peppery green salads, a warm grain salad (barley, farro, quinoa) or most hearty soups. There’s a lot of flavor and texture going on with aged cheddar, so you want a drink that stands up to that but doesn’t overpower it. We like off-dry, mature beverages that have just a touch of sweetness like saison ale, cider, bock and Belgian ales. For wine, we recommend riesling, chardonnay and champagne (whites) and syrah, pinot noir and chianti (reds). Bourbon and single malt scotch are always sure bets too.